Officially, the church we know and love as St. Paul Lutheran Church was organized in March of 1916 and was called St. Paul German Lutheran Church. The Rev. O. C. Wolff had been serving St. John's of Sparta since 1898 and was given permission to serve St. Paul's also. Prior to this time Rev. Henry Vetter served the mission field covering the area of Montevideo. After holding services in a rental location at 210 South Fifth Street in 1919, a church was purchased from Our Savior's Lutheran Church for $3,000. 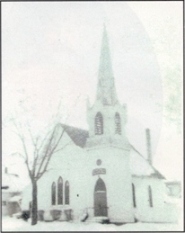 This church is now located in Pioneer Village. The purchased church was used until construction began in 1951 on the Kasota stone building that is still serving our congregation today. 1922 - St. Paul Lutheran Church joined the Lutheran Church-Missouri Synod. 1947 - A revised constitution was adopted to appoint a committee "to secure new members"
As we look back in thanks to God for the blessings of the past, we eagerly look forward to the blessings and the mission God has waiting for our congregation to proclaim the love of Christ. "...tell the next generation the praiseworthy deeds of the Lord...so the next generation would know them, even the children yet to be born...would put their trust in God..."